Nintendo have announced that those that partake within their recent Nintendo 3DS promotion to claim a free copy of 3D Classics: Kid Icarus, will also enter themselves into a prize draw to win Mario-themed Nintendo 3DS models. 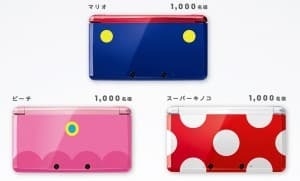 Once Club Nintendo members have registered two of the selected Nintendo 3DS games, those over the age of 18 will be able to enter a draw to win one of 3000 limited edition Mario-themed handhelds. You are allowed to enter up to five times (which requires you to register 10 differing games) and there will be 1,000 Mario, 1,000 Princess Peach and 1,000 Toad systems to be won across Europe. These were previously unveiled in a similar competition in Japan.